FILE – A voter shows her ink-stained finger after participating in Tunisia’s first post-revolution parliamentary election in the Tunis suburb of Ben Arous, Oct. 26, 2014. Five years after Tunisia became the birthplace of the so-called Arab Spring, analysts say most of the Arab countries that witnessed popular uprisings in 2011 are now worse off. The hopes for a peaceful transition from authoritarianism to democracy and social justice were dashed by new autocrats, repression, civil war and counter-revolutionary forces. "Almost every Arab country is either worse off than it was in 2011 or no significant positive change has occurred, so the phase that the region is in right now is a brutal winter,” said Amy Hawthorne, Deputy Director of Research at Project on Middle East Democracy. The one exception, she says: partial success in Tunisia. It was unique circumstances in that country that made for a different outcome. However, Tunisia is still facing significant security and economic challenges. FILE - Anti-military protesters, mostly supporters of ousted President Mohamed Morsi, gathered on the third anniversary of the Egypt's 2011 uprising in Egypt, Jan. 25, 2014. Elsewhere in the region, popular uprisings produced less successful results. In Egypt, the ouster of Hosni Mubarak was followed by unrest, political polarization, and eventually a military overthrow of his Islamist successor, Mohamed Morsi. “Mighty institutions of the state worked to reverse the democratic transition, elites showed no interest in democracy, preferring [their] own interests, and political actors — secular or Islamists — committed a great deal of mistakes getting involved in ideological fights,” said Amr Hamzawy, professor of political science at the American University in Cairo. That, according to Hamzawy, helped set the stage for the military overthrow of the Morsi government in 2013. But Hawthorne cited more specific reasons for the failed transition to democracy in Egypt. 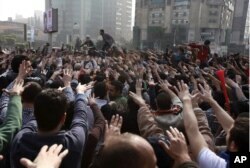 The worst failures of the Arab uprisings were in Syria, Libya and Yemen, Hawthorne said. 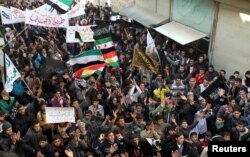 FILE - Demonstrators protest Syria's President Bashar al-Assad in Aleppo's al-Sha'ar district, Jan. 25, 2013. Hamzawy, who is also a former member of the first Egyptian parliament after the uprising, cited several lessons to be learned five years after the Arab uprisings. Hamzawy argues that one major lesson to be learned is to pay attention to regional actors, like the Gulf monarchies supporting counter-revolutionary forces and suppressing the transition to democracy in the region. Hawthorne agrees with Hamzawy, and added that organization and planning are keys to successful transitions. Hawthorne strongly believes that while the first wave of popular uprisings failed to achieve their goals, Arab masses are not giving up. “While the hopes are crushed, they are not dead; the 2011 uprisings were sort of the initial earthquake that will be followed by another earthquake that will come sooner or later,” she said. Hamzawy agrees, and notes the importance of 2011 is that Arab people emerged with a firm vision of what they are aspiring to. “People demanded social justice, democratic transition, respect for human rights, modern states — and these demands will reemerge, but no one knows exactly when or in what form,” he said.